Home › Lifestyle Financial Planning › How much is enough? Obviously, a significant part of our role as financial planners is to ensure that each of our clients has enough money invested to achieve their financial goals. We carefully plan our clients’ investments to ensure that their children can go to university, they can afford the much-needed vehicle upgrade, they can pay for their daughter’s wedding, they have enough money to last them throughout their retirement and that they can leave a legacy for their loved ones. While many people believe that financial planning is hugely complicated (and sometimes it is! ), we’ve found that the emotions, fears, anxieties and unhappiness involved in financial planning can be far more complicated than any financial formula. When a client is focused merely on making money to reach a set of materialistic goals, the process of financial planning is generally littered with episodes of happiness, misery, despair, euphoria and a plethora of other complex emotions. On the other hand, when the client shifts his focus to planning for a lifestyle that he would find satisfying, then financial planning becomes incredibly rewarding, less stressful (for both the client and the planner) and actually a thoroughly enjoyable experience. Why? Because after many, many years of research, we now know that money does not make people happy. Which means that making lots of money through clever investing is not going to make you happy, no matter how much money you make! Don’t believe me? Then read on. How’s this for interesting? Research was recently conducted in America on whether or not people felt ‘rich’ or ‘wealthy’. The results of the study showed that 4 out of 10 Americans did not feel rich. When they surveyed a group of millionaires, 42% of the millionaires interviewed did not consider themselves wealthy. Why is this? Probably because, as humans, we tend to measure ourselves in relation to others. We measure looks in relation to what other people look like. We measure our height in relation to how tall or short other people are. We measure intelligence on a scale and in relation to the intelligence of others. Similarly, we measure our wealth in relation to others. Research shows that people tend to put more weight on the relativity of their income to others rather than on the absolute value of their income. The result is that we always feel as though we are never earning enough. But how much is enough? In terms of having ‘enough’ money, it’s been suggested by many experts that a level of income sufficient to meet one’s basic human needs, keep one out of significant debt (and the associated stress) and save for retirement is considered sufficient. Anything that one earns above these basic needs is considered ‘more than enough’. This extra income can be considered ‘lifestyle’ income – money that you can use to enhance your lifestyle, follow your dreams or finance additional goals. Which is where a lot of problems begin. As humans, it is natural for us to set financial goals. Once we put a plan in place to achieve a financial goal (for example, a new car), we begin working hard to achieve that car. We compare our current car to the vehicles that our friends and family drive, and consider ourselves to fall short of the mark. Once we’ve purchased our new car, we’re likely to set new financial goals – perhaps renovations to the home. Once again, we compare our home with those of friends and family, and we believe that our home doesn’t quite compare with the homes of others. And so the cycle continues….we compare what we have to others, set new financial goals, work hard to achieve them – and every time this happens our criteria for happiness changes! Now, I’m not for one minute suggesting that we shouldn’t have financial goals and dreams. You very definitely should. I’m suggesting that you shouldn’t attach happiness to a financial goal. In fact, your happiness and your financial goals should be kept completely separate. If you’re earning more than you spend, are relatively debt-free and are saving for your retirement, then you’ve got enough. Sure, there’s a whole list of things you still want to achieve financially – the new car, the overseas holiday, the new camera – but those purchases are not going to make you happy. They’re going to enhance your lifestyle to a limited extent. In fact, when asked to rate what makes people happy, research has shown that money comes somewhere down the list after family, marriage, friends, health, social relations, community and faith. Here’s more food for thought. Psychological research has shown that money can enhance your lifestyle to a greater extent if you use it to purchase experiences rather than material possessions. So, spending money on theatre tickets and a meal at your favourite restaurant is going to boost your mood more than if you used that money to purchase a material object. The reason for this is that the meal and theatre will satisfy a basic human need for social connectedness and vitality. The experience of going to the theatre and eating dinner provides you with experiential memory capital that long outlasts the memory of a new purchase. It’s been proven that the human mind gets bored with material purchases, but that a happy memory will provide enjoyment for many, many years (sometimes even a life-time). I love this! People who are materialistic are generally less happy than those people who seek happiness through experiences. If you constantly measure your happiness in terms of your possessions and assets, you’re unlikely to ever be truly happy. Our clients who build their happiness around relationships, experiences and spiritual fulfillment are without a doubt happier, more content and more satisfied with their lives. Being realistic about what you want (or can) achieve financially will relieve you of additional stress and anxiety. Don’t compare your possessions with those of anyone else. Have financial goals based on what you really want, and not what you society thinks you need. Trying to keep up in today’s consumerist society is only going to make you feel inadequate, and less happy. Focus on engaging in positive experiences and creating happy memories. The happy memories will continue to provide you with enjoyment long after any material object can. Don’t oversave! Sure, consult with your financial planner and save enough for retirement, but don’t put away all your spare money. Not having any money to enjoy right now will only make you resentful. Acknowledge that true wealth isn’t about money. I have to admit that I’m a curious fan of both Bill Gates and Warren Buffett, not least because of The Giving Pledge that they launched in July 2010. The pledge was started by Bill Gates as a challenge to America’s wealthiest men and women to give at least half of their fortunes away. What I find incredulous is that within 6 weeks of announcing the pledge, Buffett and Gates had managed to secure the fortunes of 40 American billionaires. Why is it that 40 of America’s most intelligent and wealthy individuals willingly donated at least 50% of their fortunes to charity in a mere heartbeat? This question is easier to answer that you think. Because, through experience, they’ve learnt that money doesn’t buy happiness. That giving is far more enjoyable that taking. And that the real measure of a man’s wealth is how much he’d be worth if he had no money at all. 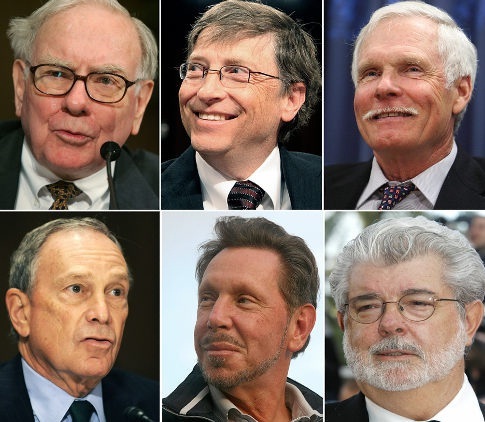 These billionaires know that money can’t make them happy.